The text version is a very raw version without pictures. Mark Benecke, B.Sc., M.Sc., Ph.D. Formerly: Office of Chief Medical Examiner, Forensic Biology Dept., 520 1st Ave, NYC NY 10016, USA, mark@benecke.com. This study was performed at the Institute for Forensic Medicine, Universität zu Köln, Melatengürtel 60-62, 50823 Köln, Germany. CURRENT ADDESS: SEE VERY BOTTOM! Footnote: Parts of this paper (cases 1 and 2) were partially reported in Benecke M. Zur insektenkundlichen Begutachtung in Faulleichenfällen, Archiv für Kriminologie 198(1996)99-109. Editors of both journals agreed that it could be included here. Klick aufs Bild oder diesen Link, um das .pdf runterzuladen! Insects are known to be useful in estimating the Post Mortem Interval (PMI). Here several cases are reported which show that a wide range of applications in medico-legal questions and hygiene together or apart from estimating the PMI can be answered by use of Forensic Entomology techniques including close observation of larval development. Case 1 describes how blowfly larvae fell of a putrefied corpse, hid and finally emerged from pupae three month after disinfection and renovation. In case 2, the entomological state of the decomposed corpse of a heroin user is described. Case 3 deals with a single adult Protophormia terranovae found in the skull of a partially mummified women, case 4 reports the finding of Serratia marcescens bacteria in red Muscina stabulans pupae which were found on a 5-day-old corpse. In case 5, blowfly eggs on the corpse of another heroin user are interpreted as an indication for the dead being laid outside at night after his death in a flat. Case 6 deals with the finding of Parasarcophaga argyrostoma which in Cologne might be an indicator species which tells if a corpse was lying outside at least for some time. Mark Benecke, Dipl.-Biol., Dr. rer. medic. Arthropods have been shown to be useful in estimating the Post Mortem Interval (PMI) (e.g. 1-9). Because insects are attracted by specific states of decay, particular species colonize a corpse for a limited period of time. This produces a faunal succession on cadavers. Together with the knowledge of growth rates under specific environmental conditions, this faunal evidence provides an estimation of time since death. the question as to whether a corpse was killed and/or brought outside (a) at night or at day and/or (b) while it was raining or not can be examined (1,3,15). Together with the impressive possibilities of estimation of PMI, the steadily increasing use of forensic entomology in a few European countries (especially in France (e.g. a laboratory of the Gendarmerie Nationale in Rosny sous Bois, and a university laboratory in Lille), Belgium and England, but also in the Czech Republic and in Russia) as well as the successful research and case work in the United States may encourage further European interest in these effective and well established techniques (15,16,57). In this article, the author wishes to focus on the wide range of applications for entomological analysis in medico-legal questions and not just those concerning estimation of PMI. Materials and Methods<p align="justify"> Insects were killed and stored in 75% ethanol (59). Dipteran larvae were bred in jam-jars which were covered with a moist piece of cloth and which were filled with dry bark and leafes and - in case of feeding larvae - with small pieces of rotten meat (18). All animals were collected before autopsy in the Institut für Rechtsmedizin der Universität zu Köln. Determination of animals followed (19-23) (flies), (19,24-26) (beetles), (1,27) (dipteran larvae/pupae), and (23,28-32) (ecology). Outside temperature and humidity were recorded half-hourly by a weather station nearby which is operated by the Landesumweltamt Essen. Weight and height of corpses are given as measured at autopsy. The corpse of an elderly caucasian woman was found dead in her flat in the third floor of a urban building on 6. November 1995. The body was discoloured and the skin was found to be partly detached due to putrefecation. Police officers reported that at their arrival many adult flies but "no striking amount" of maggots were observed on the corpse. Two days later the flat was sprayed with Pyrethrum (8.11.95), disinfected with Lysoformin (9.11.96) and then completely renovated, including fresh painting of all walls and the removal of all carpets. The flat was then left vacant. At the end of February 1996, an inhabitant of a flat in the building reported that for the past 3 month maggots were found in hers, and another occupied flat (fig. 1). Maggots were reported squeezing themselves through a bathroom partition wall made of plaster (fig. 2) and collecting under a mat near the balcony. Furthermore, the caretaker collected up to ten dead green flies per week in the vacant flat of the deceased. An inspection of the flats, which were all in a clean and proper condition, on 22.2.96, revealed five puparia and six postfeeding, slightly darkened larvae (starting to pupate) of the blowfly Calliphora vomitoria LINNÉ under a mat near the balcony situated under the vacant flat. In the flat of the deceased the following were found: (a) three dead and one febrile weak adult green-metallic Lucilia caesar LINNE, each of 7 mm in length in the bed-room and in the bath room, (b) four puparia of Calliphora spec. ROBINEAU-DESVOIDY behind unremovable floor ledges and (c) four febrile adult Lucilia caesar L. sitting in cracks in the concrete of the balcony. Up to June 1996, dead adult flies but no other arthropods were found occasionally in the vacant flat. The unusual appearance of two blowfly species which should have been killed by pyrethrum may be explained by a rapid decrease of temperature which started six days before disinfection and reached its maximum the day before the corpse was found (fig. 3). Supposedly, female flies laid their eggs on the corpse in mid September. While many eggs could develop, temperatures decreaesed and from the beginning of November many maggots started to search for secure places in which to diapause. This behavior is performed by many insects under unfavourable conditions, especially at low temperatures (e.g. 3). For that reason, Pyrethrum did not reach the hidden and nearly lifeless maggots. After renovation, the caretaker maintained the empty flat at around 14ºC. This temperature allowed pupation and hatching of some flies; however, mainly due to low temperatures in winter they could not fly away (1,3,34-40). In the laboratory (room temperature: 22ºC), the individuals which were caught in the flat showed a normal flying behavior. Case 2: Cheese skipper larvae on heroin addict<p align="justify"> A 38 year-old known heroin user commited suicide by lying her neck under the wheels of a moving train at the end of November 1995. The corpse was found under foliage in shrubbery near the track which run through the city. The soft parts of the trunk were reduced to a greasy mash. Organs of the abdominal cavity and the chest were completely disintegrated (fig. 4). A small amount of decayed tissue was found adhering to the pelvis and the extremities. A shock of hair measuring 35x20 cm (14x8 inch) was found near the skeletonized skull. A first estimate led to a post mortem interval of 2-3 months. The body was wearing jeans which were still in good condition. In the autopsy room, within the decomposed mush, but also on the uncovered bones, masses of yellow piophilid larvae of 8 mm in size could be observed jumping up to 50 cm in height or 10 cm aside for more than five hours at 17ºC. On top of leathery dried parts of skin, a nearly closed layer of pale yellow eggs was found; similar eggs were found in the shock of hair. Because the breeding room had been poisoned while breeding the eggs, determination had to be performed by use of single body parts of one adult fly which was determined as Piophila casei LINNÉ (fig. 5). P. casei is a typical inhabitant of freely exposed cadavers three to six month post mortem, i.e. in the third of eight successional waves (1,44). Because single P. casei females lying around 200 eggs, the observation of masses of eggs covering the body led to the conclusion that a first and probably a second generation of cheese skippers had hatched on the corpse. Under good conditions, Piophila eggs develop to adults within 11 to 19 days; together with the information given in (1) and our temperature data (fig. 6) a post mortem interval of 90 days (start of the third wave) plus 22 to 38 days, i.e. 112-128 days was calculated. Later it was found that the woman had been missing for four months. This case indicates that P. casei does not shorten its development significantly under the influence of heroin as was observed for some arthropods (45). However, the exact concentration of heroin could not be determined because of the severe decomposition. Under the shock of hair on the clothing of the corpse, several beetles were found which to our knowledge are not highly specific for a certain state of decay (1,44). We found two adult Staphylinidae (one Oxytelops tetracarinatus which is the most common representative of the genus Oxyteles (GRAV.) and is frequently found in excrement and rotten plant materials; one Philonthus spec.) which on their own are not suitable for estimating of PMI because of their common occurence on cadavers, e.g. even two years after burial on corpses (1). Furthermore, three adult individuals of the genus Atheta THOMSON (which lives on dry carrion but also on fungi and decaying leaves) and both larvae and two adults of the clerid "red legged ham beetle" Necrobia rufipes (DE GEER) were found. One of the Necrobia larvea immediately burrowed into a piece of gauze, pupated at 17 ºC which is 1 ºC less than its supposed lowest breeding temperature (29) (fig. 7) and hatched out after 54 days. Necrobia rufipes is known to be a late inhabitant of corpses and feeds on dry cadavers (also on mummies and ham) and probably on larvae of other arthropods. The observation of one dead pupa of Fannia (house fly) and the absence of any silphid beetles was without dignostic value but is mentioned for the sake of completeness. Case 3: Adult fly in decomposed head<p align="justify"> On the occasion of his arrest on 8. May 1996, a man told the police that his wife was lying dead in their flat and had been there for 29 days. Asked why he did not report the death of his wife the man answered that he was afraid of losing the flat. Police found the corpse with a large population of flies and larvae together with signs of mummification (fig. 8). The corpse was covered with two blankets. For the mean outside temperature was calculated to be 10.9 °C most likely the heating was turned on. Together with the known covering of the corpse and the insect producing heat (47) inside temperatures were assumed to having been constantly higher then 20 °C. During the post mortem examination, masses of maggots were found on the corpse, conspicuously in the vaginal tract and in the hair; further maggots were seen in the bladder. Unfortunately, maggots were washed away by the autopsy team before the forensic entomologist was informed. The head was partially mummified, the skin of the face, the soft tissue of the lower jar, eyes, ears and tongue were missing; the mouth was widely opened, the skull was fully intact. After detaching the skull-cap, a single adult Protophormia terranovae (ROBINEAU-DESVOIDY) was found inside the skull. The brain was missing. Inside the skull, larvae were found. It is known that Protophormia develops within 19-23 days at 22 °C from egg to adult [3,48]. In Cologne, P. terranovae is reported to be the most synanthropic species (=species associated with humans) after Musca domestica LINNAEUS and Lucilia sericata (MEIGEN) (31). However, our observation is unusual, firstly because P. terranovae ordinarily pupates on the surface of the breeding medium unless it is very wet or exposed to bright light (1; an alternative explanation might be that the fly became trapped accidentally; however development was completed under unusual bredding conditions). Secondly, P. terranovae adults are usually found on corpses more than one month after death (8), and thirdly this is the first observation of Protophormia on a corpse from the city of Cologne in our institute. Case 4: Red pupae on the corpse of an alcoholic<p align="justify"> On 14. August 1996, a 46 year old known alcoholic (80.5 kg) was found dead in his bed-room. He had been dead for 5 days. Blood alcohol concentration was calculated to be 1.6 parts per thousand. The man had a history of high blood pressure. The corpse was in a state of bloated decay. Clusters of eggs were found in his beard and in his pubic hair. Many fly larvae of 2-3 mm in length were seen mainly under skin bladders caused by putrefecation gases. Because Lucilia ceasar LINNE females were observed ovipositing onto the body in the autopsy rooms, entomological analysis focused on two dark red pupae measuring 6 mm which were found adhering to the abdomen of the corpse (fig. 9). Pupae were bred at 17°C-20 °C and two adult Muscina stabulans FALLÉN flies measuring 9 mm in lenght emerged 14 days later, on 28.8.1996. M. stabulans developing within 28 days at 16ºC from egg to adult , larvae, as a rough estimate, are supposed to having fed on the man either while he was living or while he was in a unconscious state. (If on the other this was a case of myasis and M. stabulans involvement (58) because of the body temperature of 37°C and because of the elevation of temperature by maggot masses a shorter time of development would be expected.) To determine if the man might have been fallen severely ill before he died, larvae were crushed and tested for bacteria. The red colour of the pupae and red spots on the slightly moist paper towels on which the pupae were laid appear to be caused by Serratia marcescens (Enterobacteriaceae). This ubiquitous bacterium, previously thought to be non pathogenic, is now known to cause wound infection and sepsis in people whose immune system is compromised; a reason for this is that S. marcescens is often resistant to antimicrobial substances (50). For example, in 1986 and 1987, in average 93 people died from infection with S. marcescens in the U.K. (50). An illness or infection caused by or followed by the occurence of S. marcescens together with unconsciousness could be an explanation for the occurence of Muscina stabulans larvae on the alcoholic before he died. A known drug user (28 years old, 172 cm, 61.9 kg; blood: no alcohol, caffeine 0.85 mg/L, Diazepam 0.12 mg/L, Nordiazepam 0.03 mg/L; urine: morphine 4.8 mg/L, Codeine 0.16 mg/L) was found dead near wood inside Cologne on 21.8.1996 at 7.05 am. Toxicological analysis suggested that death occured within three hours after ingestion of heroin. The dressed corpse lay freely exposed on a patch of grass; police reported that the corpse had not been seen there at 10 p.m. the evening before. Mean outside temperature was 23.1 °C (20.8.96) and 20.3 °C (21.8.96) (fig. 10). On the eyelids, masses of eggs were found (fig. 11). Using characteristics of the mouthparts, the anterior spiracles and the posterior end views of third instar larvae which were bred from eggs allowed species determination of the blow fly Lucilia ampullacea VILLENEUVE, one of the Lucilia species which is seldomly found associated to (living) humans in Cologne (31). This case is interesting for two reasons. Firstly, in the Weimar child murder case, one of Germany's most famous lawsuits, the author was asked if arthropod evidence could tell if two corpses were placed outside near woods at day or at night (56). The idea was to compare the developmenatal stages of gen. Lucilia and gen. Calliphora on the corpses. Since most authors report that Calliphora does not oviposit at night (51, see also 52), it was suggested that this might be answered by comparing the occurrence of late stages of Lucilia with the occurrence of early stages of Calliphora. The Forensic Entomologist might have been able to answer the central question of the trial if eggs, maggots and insects collected at the scene would not have been thrown away after letting them dry in a paper bag. Maybe even high quality close-up photographs (which were not taken) might have been the key to the true course of events. Secondly, the influence of drugs in corpses to the insects feeding on them is still in progress (45); thus, this case makes a small contribution to the subject by showing that Lucilia ampullacea was not repelled by a heroin intoxicated corpse. (From the life history of the person it is sure that heroin was present even if its quantity could not be determined any more.) Thirdly, the appearance of only very early developmental stages of flies (as documented by photographs) indicate that the person died in a flat and was then brought outside. As a matter of fact, in criminalistic routine it is not unusual that a heroin user is reported to have died unnoticed in the circle of his friends (the person is thought to sleep or to be on a drug trip). The friends wish to prevent questions and investigations and so they put down the corpse anywhere outside. The double system of lividities, the entomological findings, the fact that the body was lying next to a path and the walker´s declaration also support this theory. The corpse of a 66 year old man (46.5 kg, 159 cm, back-calculated alcohol level at time of death: 1.07 parts per thousand) was found dead on the balcony of his flat on the 8th floor of a urban building in Cologne. The corpse was thought to have been there for 25 days, from 31. August 1996 to 25. September 1996. The soft tissue of the face, neck and right ear was destroyed by maggots; the skin was greasy and coloured greenish-brown, the abdomen was bloated. Masses of maggots were found on the corpse. A single fly which was reared to adult was identified as Parasarcophaga argyrostoma (ROBINEAU-DESVOIDY) which is also known as Sarcophaga argyrostoma. In Cologne, P. argyrostoma is only found near muck heaps, on food containers in the Zoological Garden etc. (31). Until now, in Cologne it has never seen on corpses inside flats. Until now no information on the dependence of the hight of a flat and colonozation of corpses was determined systematically. For that reason, P. argyrostoma seems to be a highly indicative species which tells if a corpse which was found in a more or less closed environment was lying outside (here: on a balcony very near to a flat) at least for some time. P. argyrostoma might therefore turn out to be of special help in forensic investigations in urban surroundings like the city of Cologne which suffer from a fauna with a clearly restricted number of species to check wheter a corpse was (temporarily) lying outsidea flat - even on a balcony - or not. Final remarks<p align="justify"> Arthropods are not only a valuable help for estimation of the post mortem interval but can also help to answer hygienic and social questions. From a strictly forensic point of view the cases given here show that evidence can still be found after month and even after renovation of a flat (case 1); that the development of even one single species can help to give a good estimate of PMI (case 2); that especially in urban flats the environment in which a corpse was found might serverely affect the observations and interpretations of the forensic entomologist (case 3); that even if autopsy cannot settle the cause of death insect evidence might contribute to that question (case 4); that insect evidence can help to understand a double system of post mortem lividities (case 5); and that species seldomly found require special attention, e.g. to determine if a corpse was lying inside or outside in an urban context (case 6). Not only the species which are usually reported from crime scenes might be forensic indicators: For insects being the most numerous group of animals on earth (75% of all animals (Oldroyd, after (53))) and because of them living even in extreme habitats including graves (e.g. 44, 53), insects whos biology is yet not completely understood might be valuable tools for forensic invetigations. This might be a field for further research activities. 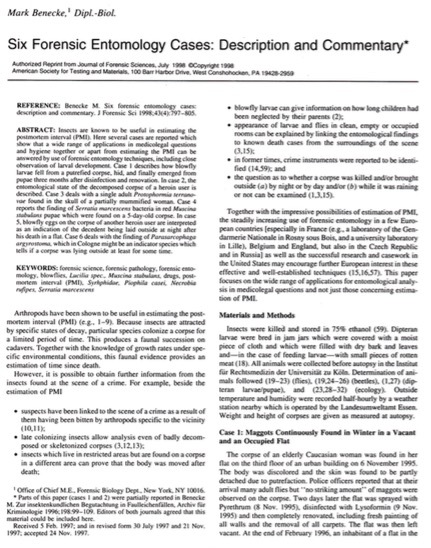 To make full use of the potential of arthropod evidence, the author agrees with Erzinclioglu (16) that it would be of greatest help to establish a routine zoological analysis in forensic medicine which might be supported by DNA typing (54,60) and thus to allow Forensic Zoology to take its place among the other sub-disciplines of Forensic Sciences. Note<p align="justify"> The author is aware of the fact that the present-day way to name insects might not reflect true phylogenetic relationships (55). However, for lack of anything better the author for the present uses this system of classification. Benecke M. Detektive nutzen sechs- und achtbeinige Helfer. Süddeutsche Zeitung 1996 May 2; p. 35 (col. 2-5). The author sincerely thanks the following persons: Dr. Heidi Schütt-Gerowitt from the Institut für Mikrobiologie und Hygiene der Universität zu Köln who reared and identified the bacteria (case 4); Dr. Bryan Turner, King´s College, London, and Dr. James Wallman, University of Adelaide, who made valuable suggestions and helped in preparing the manuscript; Prof. Dr. Zakariah Erzinçlioglu, University Cambridge, who kindly determined Parasarcophaga argyrostoma (case 6) and made helpful comments on the mansucript; Dipl.-Biol. Arndt Metzen, Köln, who confirmed determination of P. scaber (case 5); Dr. Frank Glenewinkel and Jochen Manderla, Universität of Köln, who always keep their eyes open for maggots and flies (e.g., case 3); Dr. Beier and Dr. Kohlert of the Landesumweltamt Essen who continuously provide outdoor temperature data; Dr. Sticht, Prof. Dr. Käferstein and Dr. R. Iffland, all at the University of Köln, who determined toxicological and blood alcohol data, Dr. H. Graß, Dr. F. Pluisch, Prof. Dr. B. Madea, Dr. W. Grellner, Dr. P. Schmitt, who performed medical post mortem examinations, and Prof. Dr. M. Staak, head of the institute, and Dr. Cornelia Schmitt, who allowed the author to perform his work on forensic entomology. Fig. 1: View into the bathroom of a flat situated one floor beneath a flat in which a corpse had been found three month ago (case 1). Fig. 2: In case 1, blowfly larvae were reported to squeeze themselves through a bathroom partition wall made of plaster. Note the adhesive tape which was thought to prevent larvae from entering the room. Fig. 4: Corpse of a 38 year-old known heroin user which was found under foliage in shrubbery near the rails which run through the city. Organs of the abdominal cavity and the chest were completely disintegrated. Within the decomposed mush, but also on the uncovered bones, masses of piophilid larvae could be observed (case 2). Fig. 5.: Piophila casei L. is a typical inhabitant of freely exposed cadavers three to six month post mortem. In case 2, the wing (C) was the main key for determination. A: Adult P. casei. B: P. casei larva, left: relaxed, right: ready to skip. Fig. 6: Temperature profile in case 2. Fig. 7: The developmental stage of this pupated Necrobia rufipes individual (sketch) helped to estimate PMI in case 2. Fig. 8: A single adult Protophormia terranovea was found inside the skull of this women. She was lying dead in her flat for 29 days (case 3). Fig. 10: Temperature profile in case 5. Interrupted line: Time when corpse was not seen by a person out for walk at the site where the corpse was found later. Continuous line: Time when corpse was found. Fig. 11: Masses of fresh Lucilia ampullacea eggs on the eyes of a known drug user (28 years old) who was found dead near woods at 7.05 am freely exposed on a patch of grass (case 5).